If you’re looking for a typical parenting book, this is not it. This is not a treatise on how to be a mother. This is a book about a young girl who moves to a new town every couple of years; a misfit teenager who finds solace in a local music scene; an adrift twenty-something who drops out of college to pursue her dream of making cheesecake on a stick a successful business franchise (ah, the ideals of youth). Alone in a new city, she summons her inner strength as she holds the hand of a dying stranger. Davies is a woman who finds humor in difficult pregnancies and post-partum depression (after reading “Pie” you might never eat Thanksgiving dessert the same way). She is a divorcee who unexpectedly finds second love. She is a happily married suburban wife who nevertheless makes a mental list of all the men she would have slept with. And she is a parent who finds herself tested in ways she could never imagine. In stories that cut to the quick, Davies explores passion, loss, illness, pain, and joy, told from her singular, gimlet-eyed, hilarious perspective. 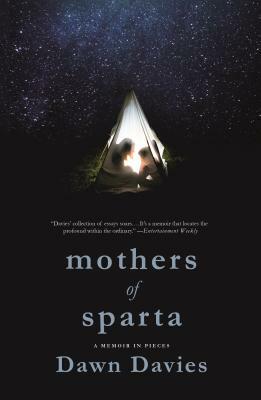 Mothers of Sparta is not a blow-by-blow of Davies’ life but rather an examination of the exquisite and often painful moments of a life, the moments we look back on and say, That one, that one mattered. Straddling the fence between humor and, well…not humor, Davies has written a book about what it’s like to try to carve a place for oneself in the world, no matter how unyielding the rock can be. Dawn Davies has a BA from Vermont College of Fine Arts and an MFA from Florida International University. She is the recipient of a Pushcart Special Mention, and her work has been published in numerous journals and anthologies. She lives in Fort Lauderdale, Florida, where she does everything from work construction to teach college writing. Mothers of Sparta is her debut.